Writer's note: I am bringing you a special Update focused on just Star Wars: Galaxy's Edge, the new themed land coming in 2019 to both coasts, and Star Wars: Secrets of the Empire from ILMxLAB and The VOID, which opened on Saturday at Disney Springs at Walt Disney World and is scheduled to open on January 5, 2018, at Downtown Disney at Disneyland Resort. 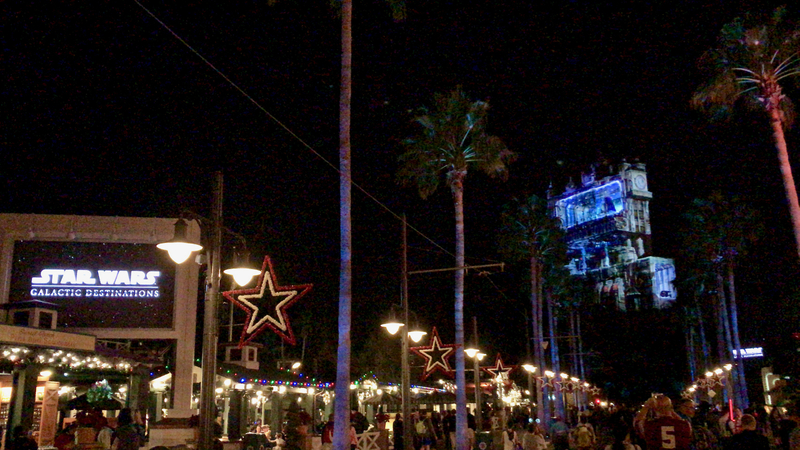 Our regular Disneyland Resort and Walt Disney World Resort Updates will be along in due course this week too, though. For those that hope to see the Disneyland crowd forecast for the week from our friends at TouringPlans.com on a Monday morning; I have included those and a sneak peek at the Walt Disney World Resort forecast too. As you very likely are aware, Disney-owned Lucasfilm Ltd. released Star Wars: The Last Jedi in U.S. theaters last week. Walt Disney World Resort celebrated the release by inviting media, select cast members (particularly from "Star Wars Experiences" at Disney's Hollywood Studios), and a number of lucky Disney Parks Blog fans to the Resort's very first screening on Thursday, December 14 at 6 p.m. Then, at 7 a.m. on Saturday morning, the team behind the new Star Wars: Secrets of the Empire "hyper-reality experience" at Disney Springs held a ribbon-cutting ceremony and invited the media to get suited up and try the experience. 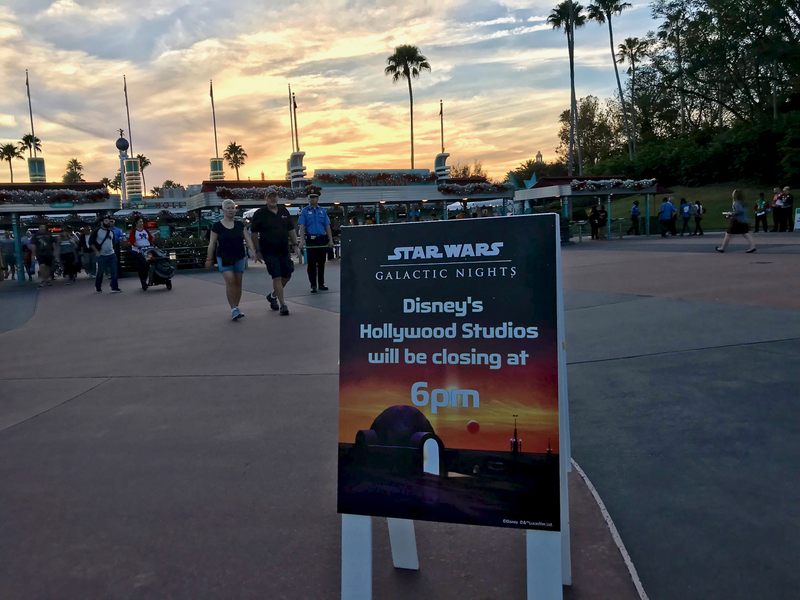 On Saturday night, Disney's Hollywood Studios closed early to host the second-ever-edition of its hard ticket "Star Wars: Galactic Nights" event which included a panel discussion about the Star Wars: Galaxy's Edge lands under construction on both coasts. 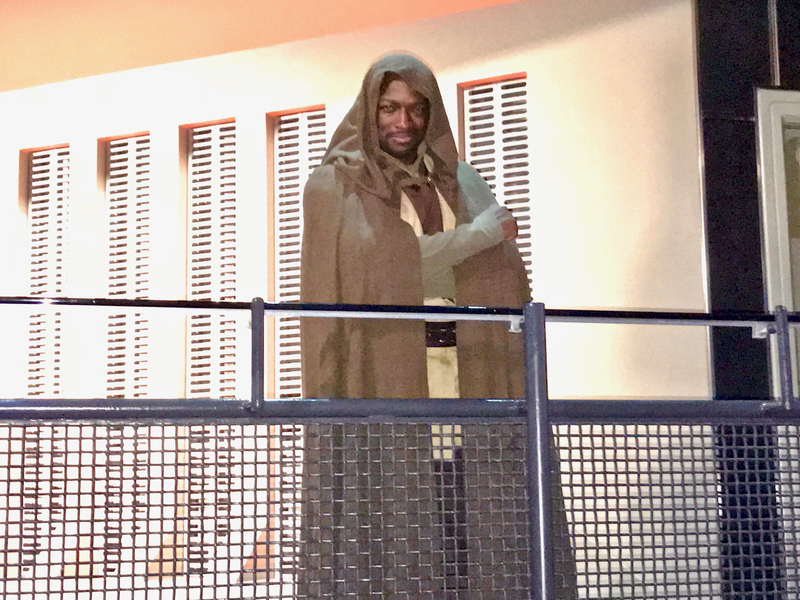 Since I was the local MousePlanet contributing writer invited to attend all of these Star Wars events, and I was privileged enough to do so, I now bring you this special update. 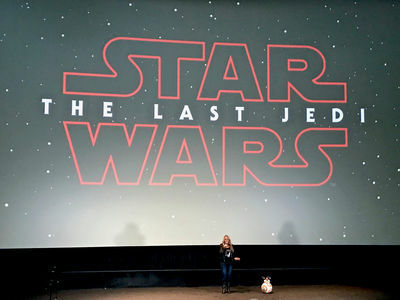 I will leave it to other writers to bring you more complete Star Wars coverage and promise that this update will be as spoiler-free about The Last Jedi as any of the movie trailers have been, will be spoiler-free about the surprises of "Secrets of the Empire," and will reveal just the details about the new lands announced by the creative team. Star Wars: Secrets of the Empire is a brand new, separately-ticketed activity described by its creators at ILMxLAB and The VOID as a "hyper-reality experience." 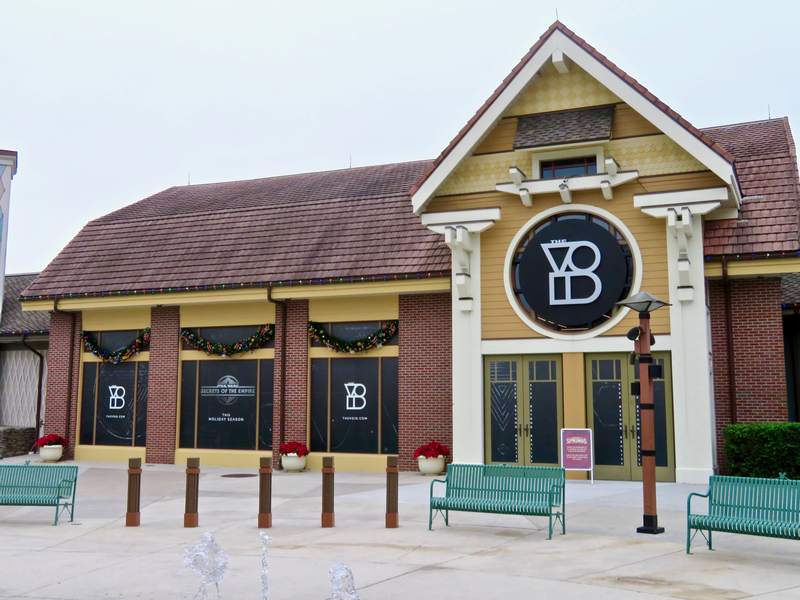 It opened in the Marketplace neighborhood of Disney Springs at Walt Disney World Resort in Florida on Saturday, December 16, 2017, and it is scheduled to open in Downtown Disney at Disneyland Resort in Anaheim, California, on January 5, 2018. The VOID "Experience Center" at Disney Springs at Walt Disney World is located in the former middle section of the Once Upon A Toy store (between the remaining portion of the store and the Bibbidi Bobbidi Boutique) in the Marketplace neighborhood of Disney Springs. File Photo by Alan S. Dalinka. 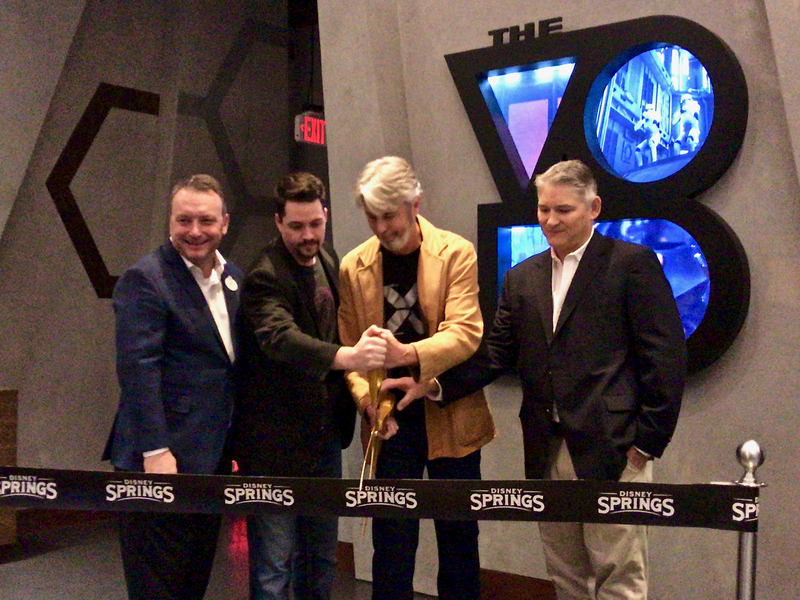 Disney Springs Vice President Keith Bradford joins the team from The VOID and ILMxLAB to cut the ribbon for the new experience now open at Walt Disney World Resort. Video by Alan S. Dalinka. 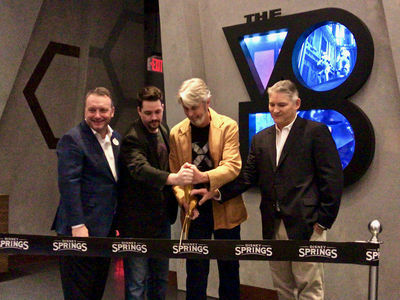 The VOID "Experience Center" at Disney Springs at Walt Disney World Resort opened on December 16, 2017; it is due to open at Downtown Disney at Disneyland Resort on January 5, 2017. Photo by Alan S. Dalinka. 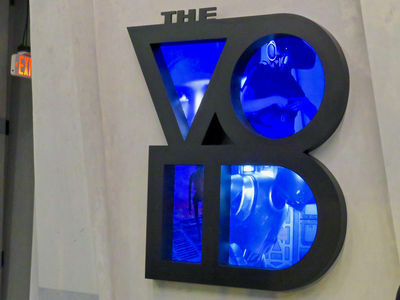 The video displayed in the letters of The VOID logo in the lobby of the Experience Center provide glimpses of the experience inside. Photo by Alan S. Dalinka. Under the orders of the budding rebellion, you and your friends will travel to the molten planet of Mustafar. Your mission is to recover Imperial intelligence vital to the rebellion's survival. Alongside the pragmatic droid K-2S0, your team must navigate through an enemy facility walking into danger at every turn. 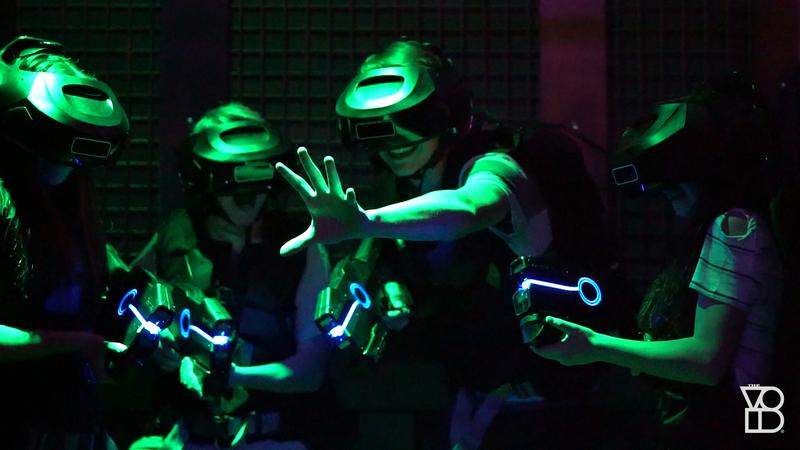 Disguised as Stormtroopers, grab your blaster, solve puzzles, and fight giant lava monsters in an effort to complete your mission. As a "hyper-reality" experience, participants must wear rather extensive gear. While it does not require physical exertion like running or climbing, the gear has some weight to it. As such, participants must be at least 10 years old and must be at least 48 inches tall. 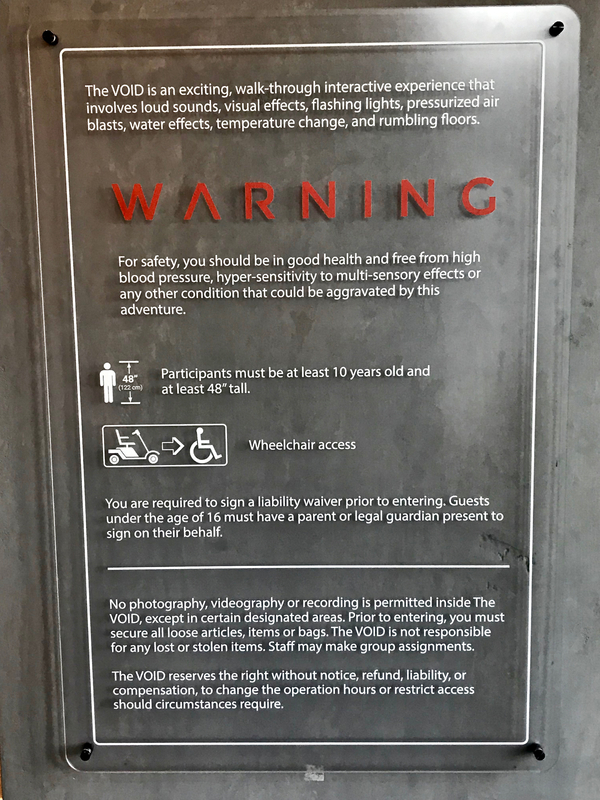 Accommodations are available for folks requiring accessibility assistance, but guests may only use a wheelchair that does not exceed 34 inches in width. A complimentary wheelchair is available and participants using electric conveyance vehicles or scooters may be asked to transfer. 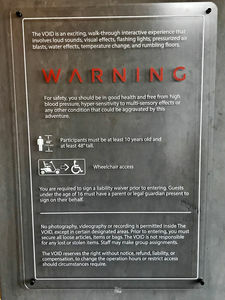 The warning sign in the lobby of The VOID Experience Center lists the experience's physical demands. Participants sign a waiver (and adults sign for their accompanying minor children). Photo by Alan S. Dalinka. At check-in, participants receive a wrist band with a scannable QR code. Up to four participants are then grouped together in the Staging Area and then, together, led to a large video screen for personal selection of individual avatars (linked by the wristband QR codes) and the initial instructions for participating in the experience. The groups are then led to the room where they get their gear. 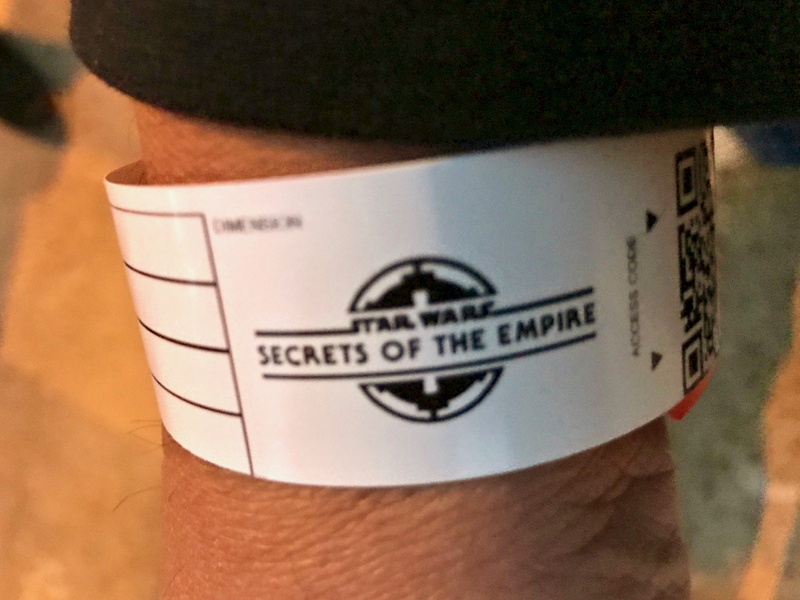 At check-in, guests receive a coded wrist band that is then linked to the guest-selected avatar and the gear worn during the experience. Photo by Alan S. Dalinka. Once suited up, the experience really does take virtual reality to a new level of detail. The only surroundings participants see are those displayed in the visor, and those details come really close to looking like the real thing. No matter which way a participant looks, a fully-rendered world which is rich in visual detail can be seen. Sound, touch, smell and motion effects all are used to completely envelop participants in the story. When walking across a "room" or other location, the texture of the floor feels like it changes under foot to match what the visor displays. Doors to walk through open and close, leading you from place to place during the adventure. When participants see the lava of Mustafar, they smell it too. There are more physical sensations to experience along the way, but I will avoid the spoilers here. 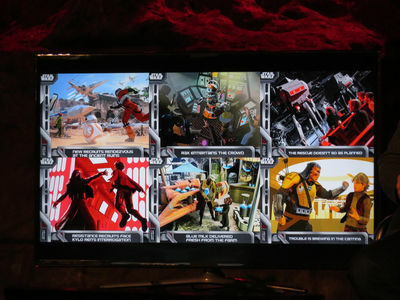 Star Wars: Secrets of the Empire immerses participants in the time of the Galactic Empire in places that will be familiar to fans of the films. Images courtesy of The VOID and ILMxLAB. During the experience, participants see each other (and, indeed, themselves) in the hyper-reality avatars selected at the start of the experience. The actual reality looks more like this image courtesy of The VOID and ILMxLAB. All told, the experience can last approximately 30 minutes from check-in until departure. That total time does include getting introduced to the experience and getting suited-up and out of the gear at the end. The activity portion (from my experience and that of some others on opening day) lasts approximately 10-15 minutes. The VOID is a destination that allows participants to explore "fully immersive worlds." The VOID says it is "on a mission to transport everyone, everywhere on adventures that until now could only be dreamed about." Away from the Star Wars universe, The VOID also has locations in New York, Toronto, and Dubai, where participants enter the "Ghostbusters Dimension." 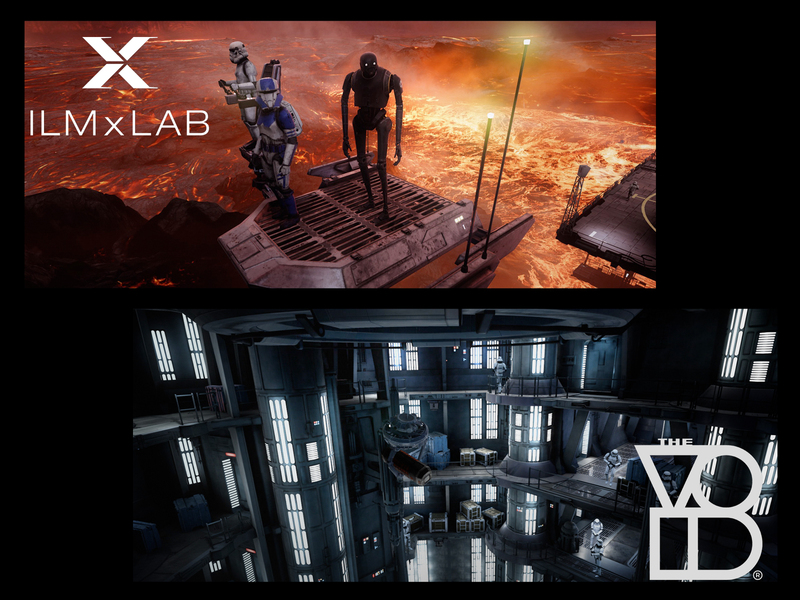 ILMxLAB is part of Disney-owned Lucasfilm's immersive entertainment division. Its goal is to combine storytelling with technology to create immersive entertainment. It develops experiences for virtual reality, augmented/mixed reality, real-time cinema, theme park entertainment, and narrative-based experiences for future platforms. Tickets are on sale at thevoid.com for $29.95/person for Disney Springs and Downtown Disney locations. An additional VOID Experience Center also opened in London on December 16, and this experience will open at additional centers around that globe that will be announced soon. I thoroughly enjoyed my experience. While I was an invited media guest and got to participate before it was open to the public the morning of its debut, it is an experience that I also had bought a ticket to try later in the day (I gave my ticket to my brother who also thoroughly enjoyed the experience) and look forward to purchasing a ticket to experience again in the not-too-distant future. The experience is so rich in immersive detail, there is more to see and experience than I did on a single visit and, indeed, since interacting with the group is part of the experience, that dynamic alone means it should be fun to go back and do it with more friends in the future, both those that have experienced it before and those that are trying it for the first time. 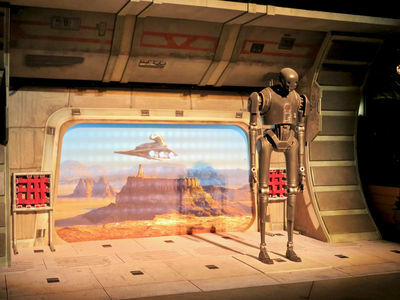 Moreover, the promise of the technology used in this experience for the future of themed entertainment around Disney Parks and resorts cannot be understated. 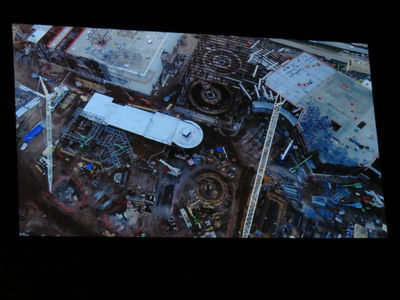 With Lucasfilm's ILMxLAB on board on this project, no doubt, some of the wizardry used here will find its way into Star Wars: Galaxy's Edge and, perhaps, beyond. 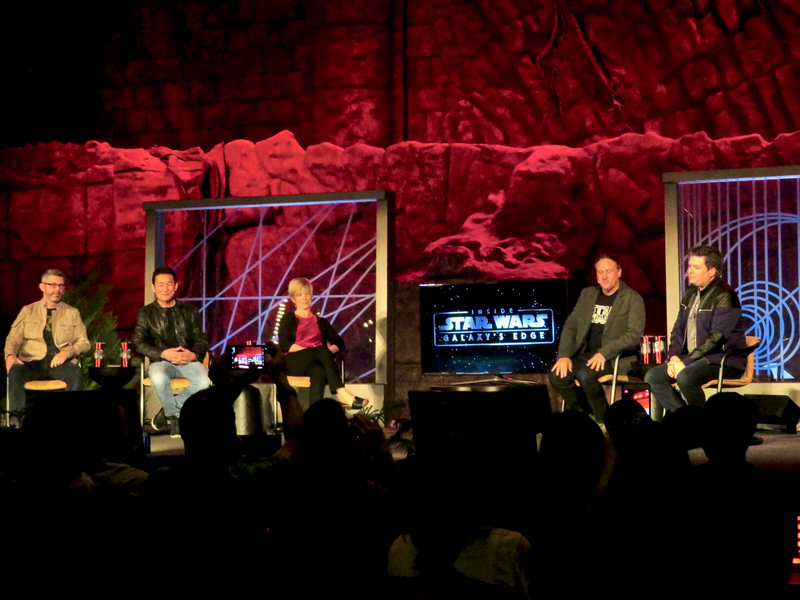 The advertised highlight of the hard ticket Star Wars: Galactic Nights event at Disney's Hollywood Studios at Walt Disney World on Saturday night, December 16 (after the park closed to day guests), was the panel presentation hosted by David Collins (known for his work on several Star Wars films and video games), and featuring team members from Walt Disney Imagineering and Lucasfilm involved in the creation of the new Star Wars-themed lands named Star Wars: Galaxy's Edge expected to debut in 2019, first at Disneyland and then at Disney's Hollywood Studios. Not surprisingly, the panel provided only a small additional taste of the rich details being created for the new lands, but it certainly does make it seem (at least to me) exciting to anticipate what is to come. 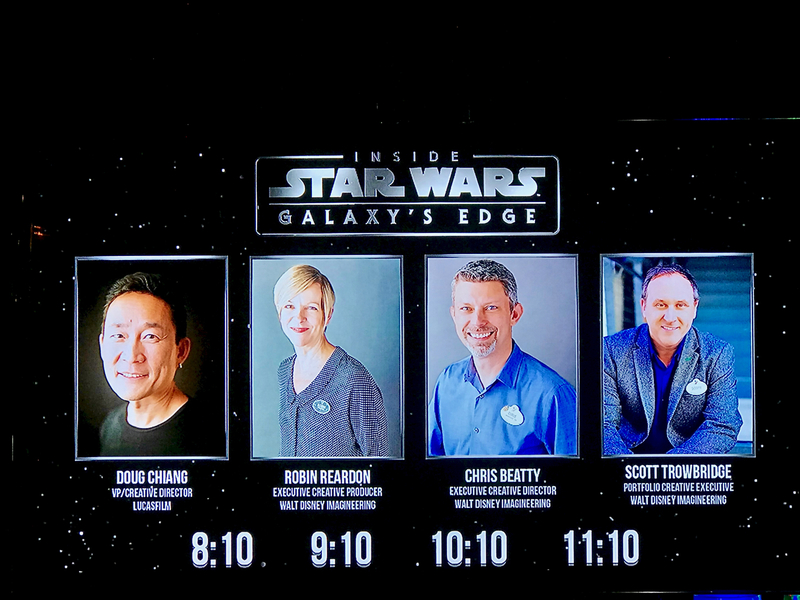 A panel of members of the creative team behind the making of Star Wars: Galaxy's Edge (presented several times over the course of the night) was the advertised highlight of Star Wars: Galactic Nights at Disney's Hollywood Studios on December 16, 2017. Photo by Alan S. Dalinka. At the 8:10 p.m. presentation, host David Collins was introduced by Warwick Davis who has appeared in numerous roles in Star Wars films dating back to his role as an Ewok in "Return of the Jedi." Photo by Alan S. Dalinka. 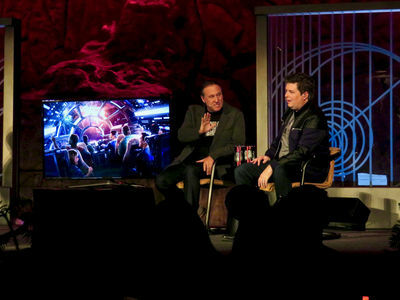 Imagineer Chris Beaty, Dough Chiang from Lucasfilm, Imagineer Robin Reardon, and Imagineer Scott Trowbridge (shown from left to right) took the stage to discuss the making of Star Wars: Galaxy's Edge with host David Collins during Star Wars: Galactic Nights at Disney's Hollywood Studios on December 16, 2017. Photo by Alan S. Dalinka. Host David Collins showed what he said was the only behind-the-scenes photo he was allowed to share from his meetings with the creative team for Star Wars: Galaxy's Edge. This is the team's conference room table. Photo by Alan S. Dalinka. The panel, led by Scott Trowbridge, Portfolio Creative Executive, Walt Disney Imagineering, along with fellow imagineers Robin Reardon and Chris Beaty, and Doug Chiang from Lucasfilm, focused on their goal of providing authenticity—a real place in the Star Wars universe that folks have not seen yet but still seems familiar to those stories. Chris Beaty, for example, discussed research trips to the markets of Istanbul and Marrakech to provide inspiration for the creation of those that guests will find in the new lands. The market stalls will sell merchandise unique to the lands; for example, the Toydarian, a creature introduced in The Phantom Menace, sells toys that look like they were hand-crafted by the locals. 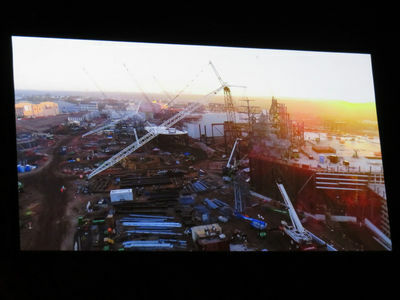 The panel showed off video of the current state of construction of Star Wars: Galaxy's Edge at Disney's Hollywood Studios. Photo by Alan S. Dalinka. The panel said the video of construction of Star Wars: Galaxy's Edge at Disney's Hollywood Studios was recorded earlier in December and was less than a week old. Photo by Alan S. Dalinka. 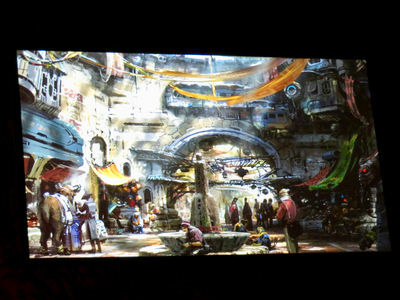 The panel showed artists' renditions of the highly-detailed marketplace guests will find inside Star Wars: Galaxy's Edge and discussed how the team took inspiration for these "real" places from the actual marketplaces visited on research trips to places such as Istanbul and Marrakech. Photo by Alan S. Dalinka. Although the panel never mentioned Pandora–The World of Avatar that opened at Disney's Animal Kingdom back in May to much acclaim, the team behind Galaxy's Edge clearly are paying every bit as much attention to the smallest details as the Pandora team did, if not more. "It's all about story," is a constant refrain from the team. 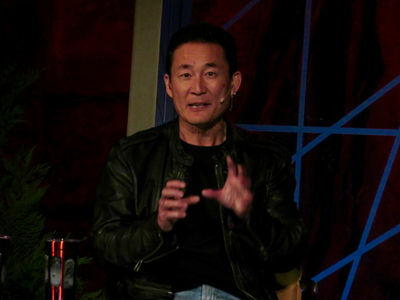 To support the story, though, as Doug Chaing described the "cheats" that filmmakers get to take when creating things seen by cameras, he said that in the parks, they are building things "for real." For example, he said that an entire fleet of full-size X-wing starfighters that feel real to the touch will be part of the new lands as well. 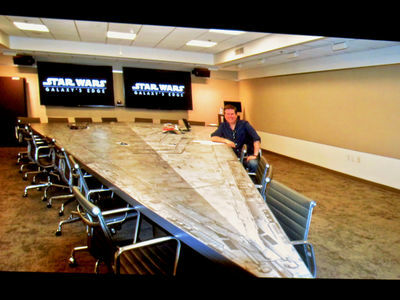 Unlike the plywood and foam used to create props for movies, in the parks, he said the materials are the same sort of quarter inch of aluminum over a steel frame that real aircraft use. He said the graphics all have meanings and are not just decorations. 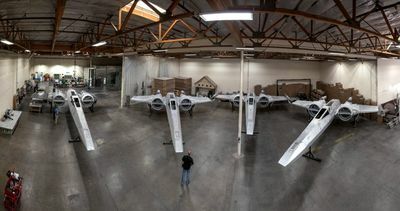 An entire fleet of "real" X-Wings are being built for Star Wars: Galaxy's Edge. Photo ©Disney. Doug Chaing described the differences between "cheats" that filmmakers get to take when creating things seen by cameras versus what the team is building for the theme parks. Photo by Alan S. Dalinka. 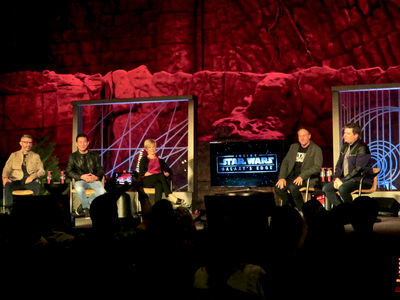 The panel shared that guests will actually get to climb through the Millennium Falcon hatch, walk through its hallways, sit in the cockpit, and then be in control of the ship on a mission that guests control. The missions go beyond Batuu (the planet that is Galaxy's Edge) to other places folks have not seen before, but will feel "completely Star Wars." 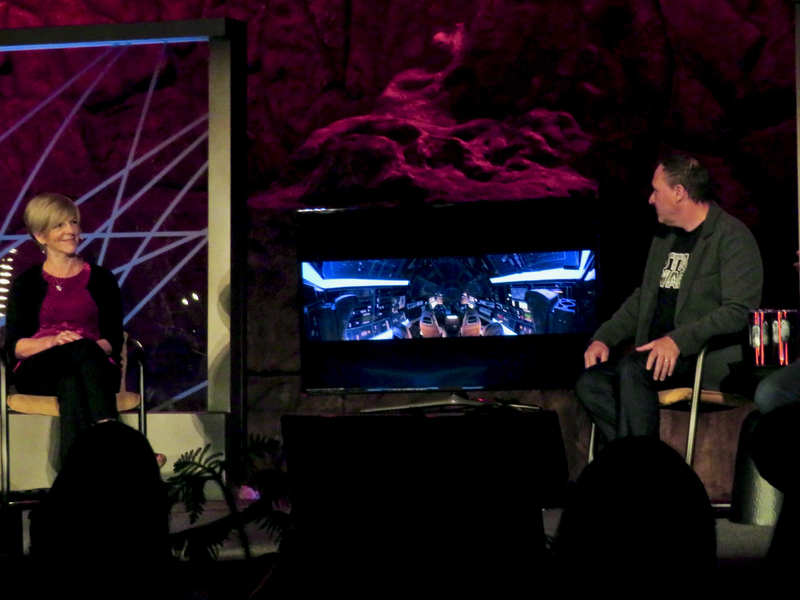 Scott Trowbridge discussed how guests will visit the "real" "Millennium Falcon" with Host David Collins. Photo by Alan S. Dalinka. 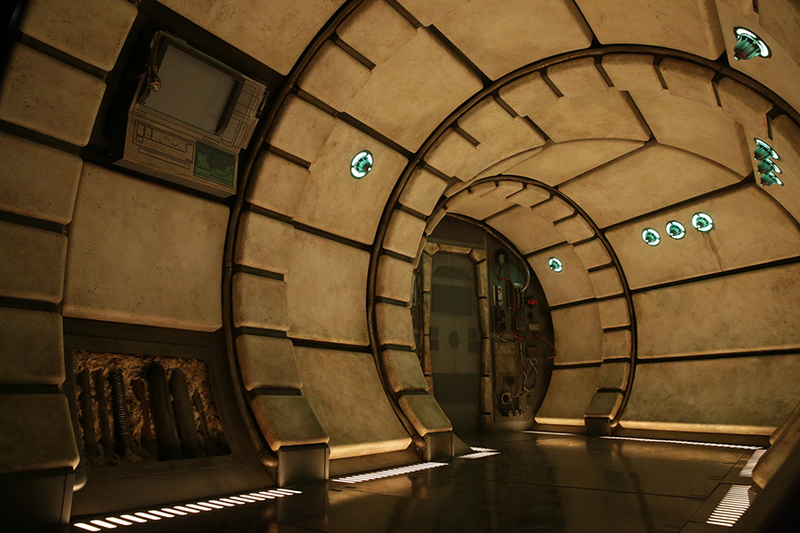 Guests will be able to walk through the halls of the "Millennium Falcon" in Star Wars: Galaxy's Edge. Photo ©Disney. 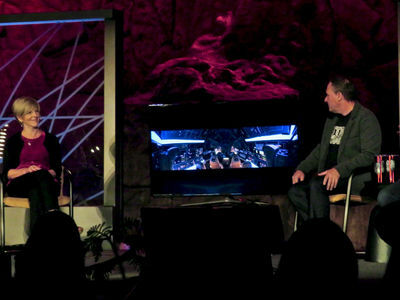 Imagineers Robin Reardon and Scott Trowbridge repeatedly mentioned that guests will be in control of their mission aboard the "Falcon" from the cockpit. Photo by Alan S. Dalinka. 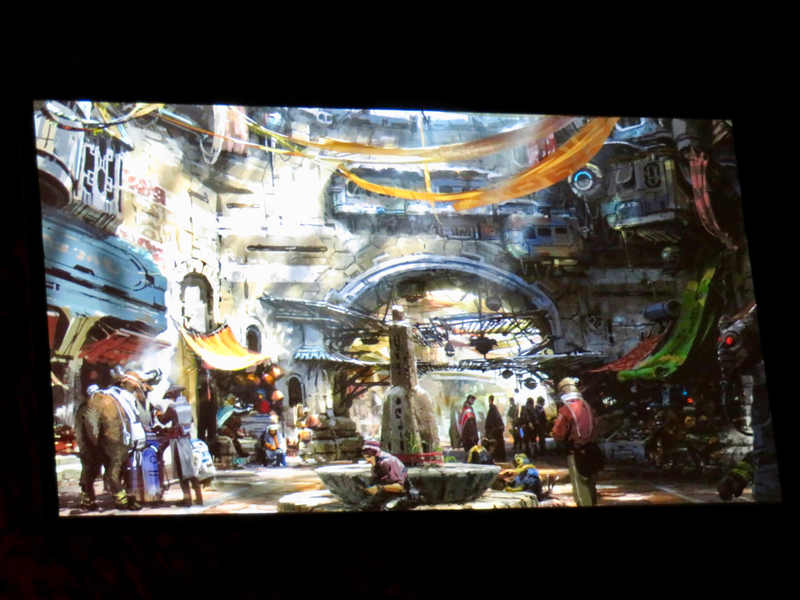 Finally, the panel mentioned that there will be special Star Wars: Galaxy's Edge trading cards available in the new land that contain various clues to adventures. 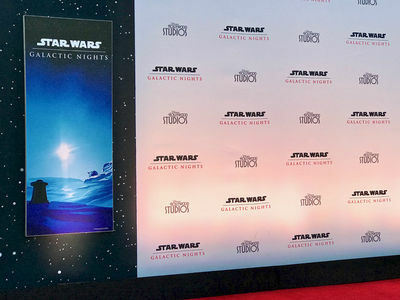 All guests attending Star Wars: Galactic Nights received a starter set of these cards, including an aurebesh translator card. I will leave it to our Star Wars experts to discuss the aurebesh language in more detail elsewhere on MousePlanet. The panel showed samples of some of the trading cards that will be available in Star Wars: Galaxy's Edge. Photo by Alan S. Dalinka. Star Wars: The Last Jedi Opening Night was celebrated at Disney Springs on December 14. 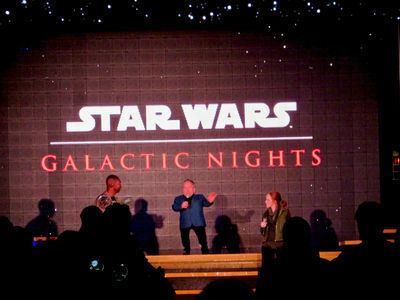 Star Wars: Galactic Nights Event took place at Disney's Hollywood Studios on December 16, 2017. 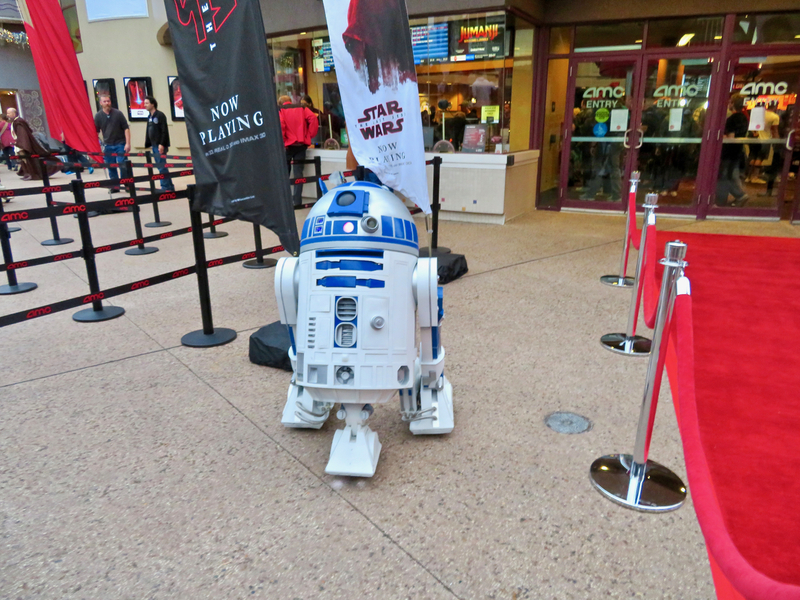 The AMC 24 Dine-In Disney Springs Theatres hosted screenings of "The Last Jedi" on December 14 and featured a red carpet. HDR Photo by Alan S. Dalinka. 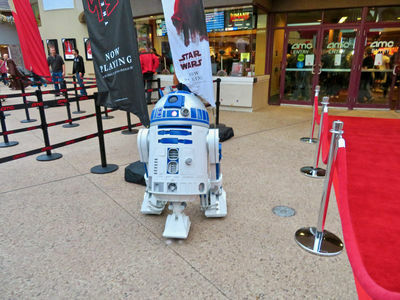 Local fan groups brought out their highly detailed droids for the red carpet screenings at Disney Springs. Photo by Alan S. Dalinka. 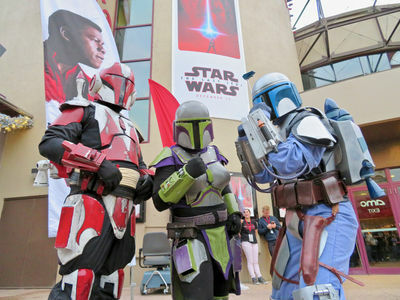 A number of local fans wore highly detailed costumes ahead of the red carpet screenings at Disney Springs. Photo by Alan S. Dalinka. 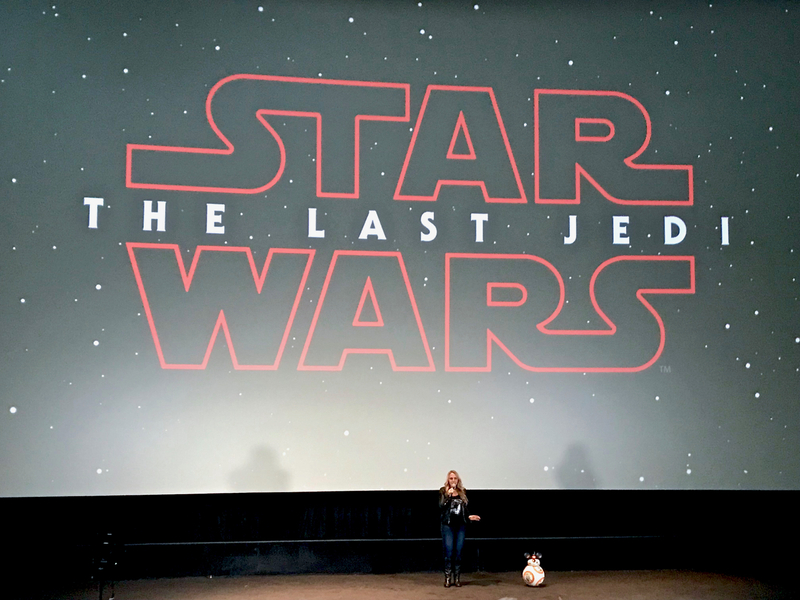 Jennifer Fickley-Baker and BB-8 welcomed Disney Parks Blog's invited fans, the media, and select cast members to the first Disney Springs screening of "The Last Jedi" on December 14, 2017. Photo by Alan S. Dalinka. 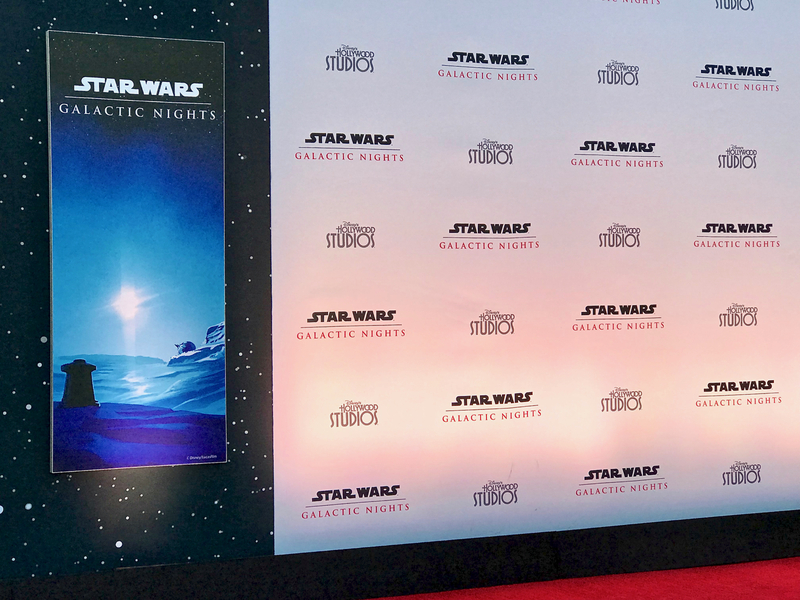 Disney Parks Blog posted a spoiler-free recap of the film's red carpet debut. Video ©Disney. 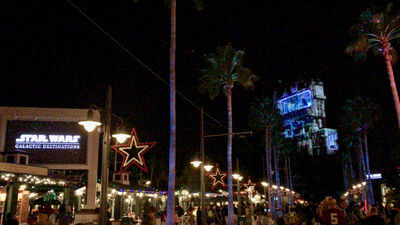 Disney's Hollywood Studios closed early on December 16 for day guests to make way for the Star Wars: Galactic Nights hard-ticket event. HDR Photo by Alan S. Dalinka. 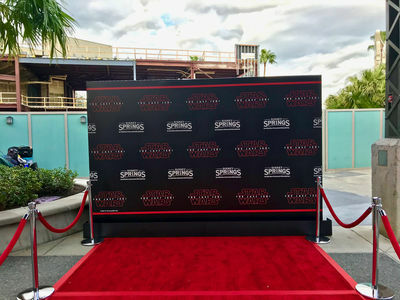 Red Carpet photo opportunities were available to guests at Disney's Hollywood Studios outside the front gate on the evening of Star Wars: Galactic Nights. Photo by Alan S. Dalinka. 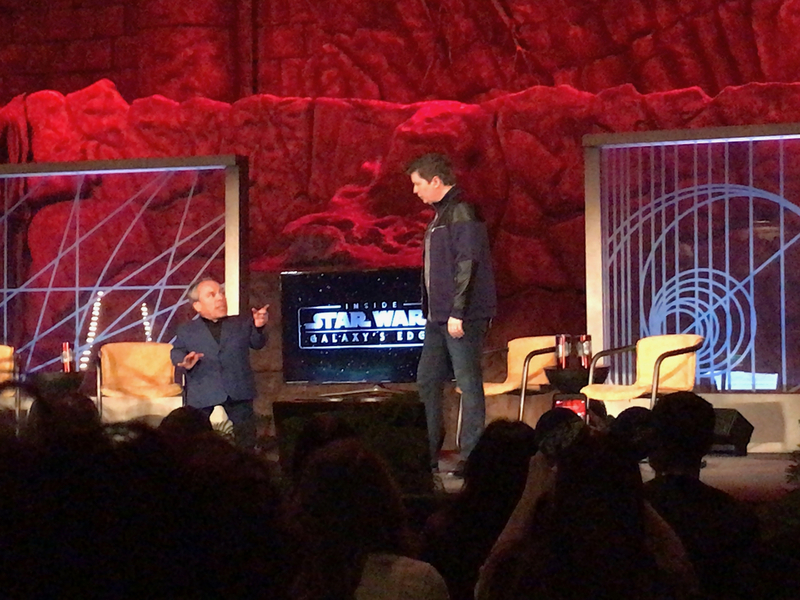 Starting with a bit of introduction and Warwick Davis, the spoiler-free video includes an appearance by Darth Vader. Video by Alan S. Dalinka. Warwick Davis, known for his appearances in several "Star Wars" films, greeted folks attending Star Wars Galactic Nights from the Center Stage at the beginning of the Event. Photo by Alan S. Dalinka. 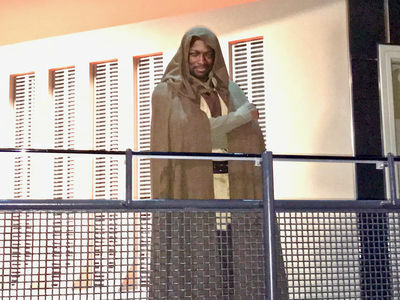 A Jedi Knight posed for photos inside the queue for Star Tours: The Adventures Continue. Photo by Alan S. Dalinka. 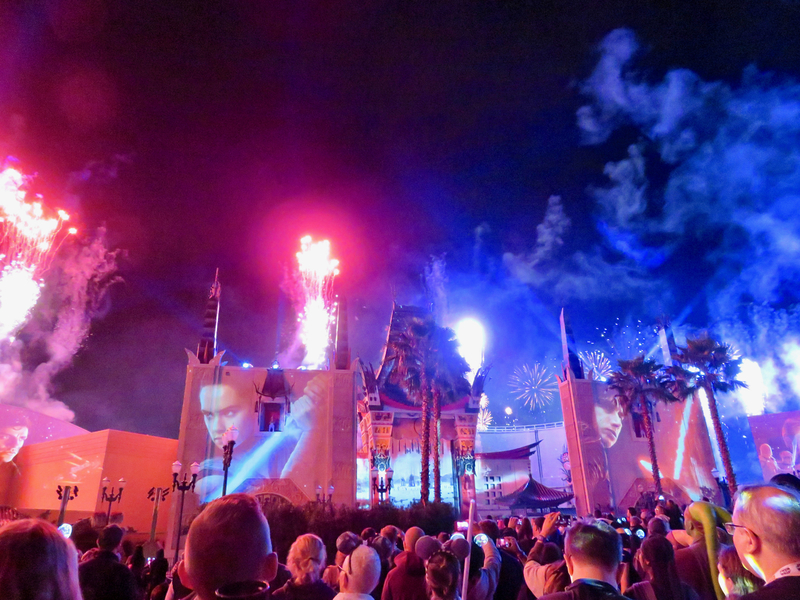 The projection technology recently installed for Sunset Seasons Greetings on Sunset Boulevard this holiday season was used for a special one-night showing of "Star Wars: Galactic Destinations" all night during the Event. Photo by Alan S. Dalinka. The special "Star Wars: Galactic Destinations" included projected images from all eight Episodes of the Star Wars Saga. Video by Alan S. Dalinka (does not include spoilers for Episode VIII: The Last Jedi). 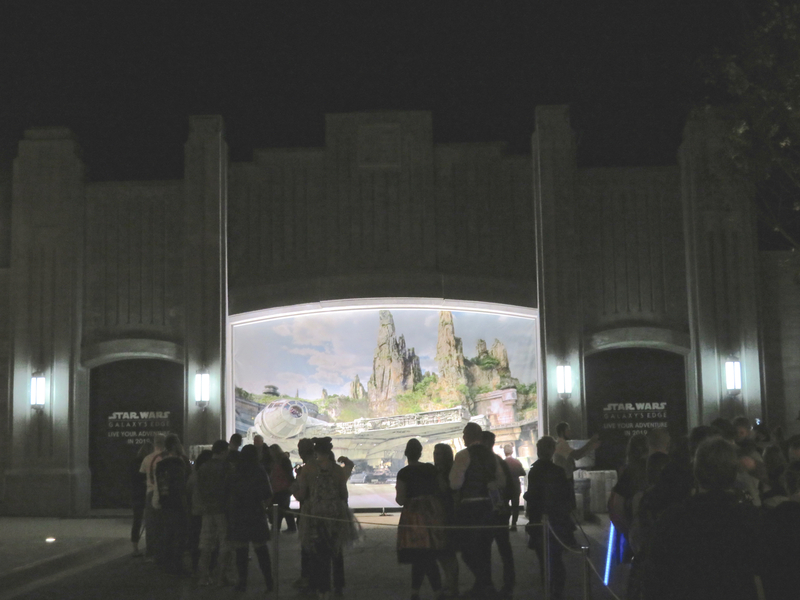 The future entrance to the new land at the park, Star Wars: Galaxy's Edge, was decorated as a photo opportunity for the Event. Photo by Alan S. Dalinka. Guests at the event could pose with Droid K-2S0 in a setting from "Rogue One." Photo by Alan S. Dalinka. 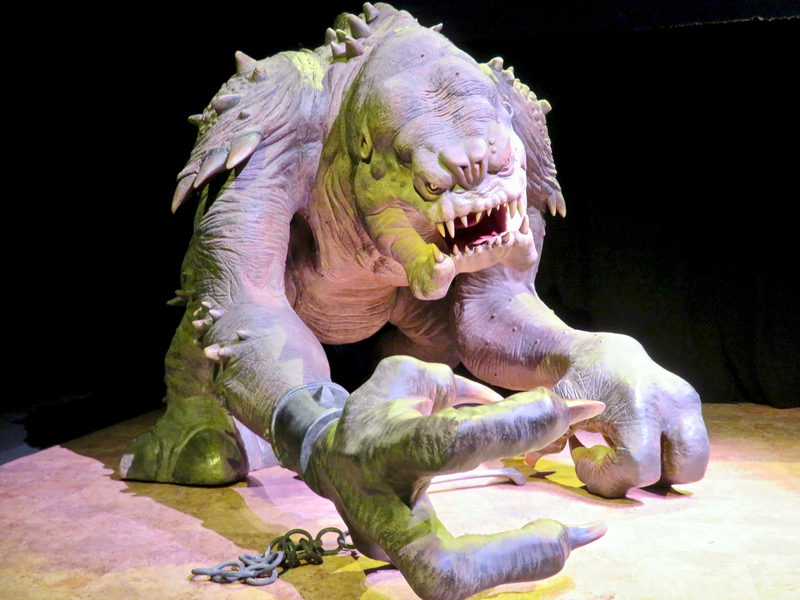 A life-sized recreation of the rancor, a character Luke Skywalker encounters in "Return of the Jedi," was also one of the many photo opportunities during the event. Photo by Alan S. Dalinka. 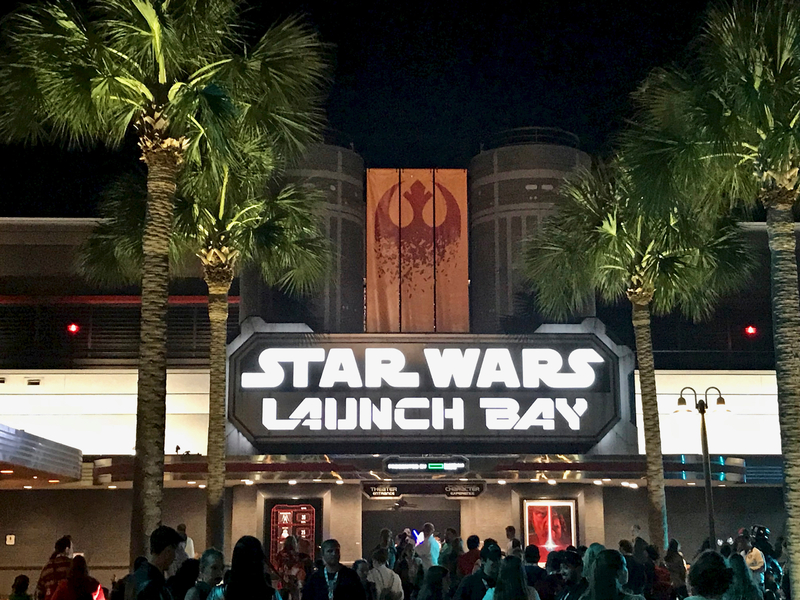 The Star Wars Launch Bay's exterior banner has changed with the debut of "The Last Jedi" and it includes several new props inside. 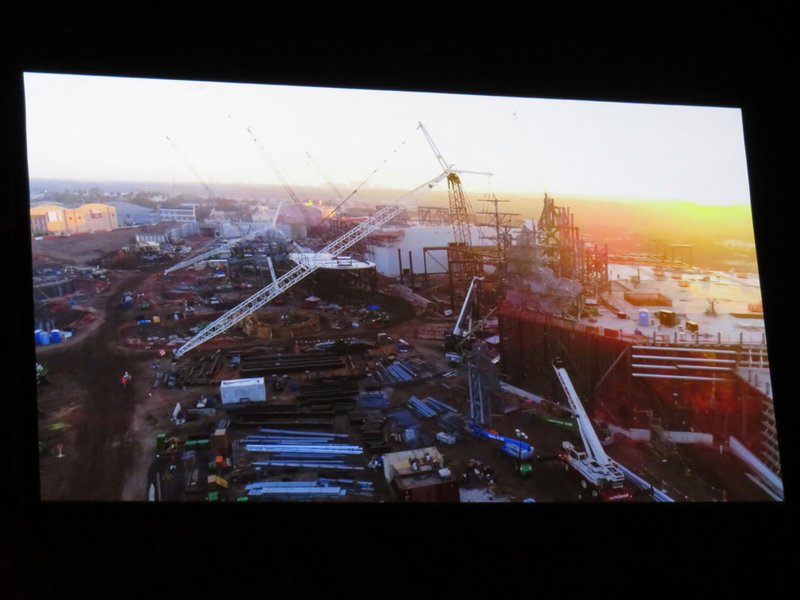 (More photos in the next edition of the Walt Disney World Resort Update.) Photo by Alan S. Dalinka. The latest version of Star Wars: A Galactic Spectacular concluded the event and included new images drawn from "The Last Jedi" along with all of the other Star Wars films. Photo by Alan S. Dalinka. Don't forget: The MousePlanet Newsletter is here! The newsletter contains a recap of the week's articles (in case you miss a day), news that may have developed since the weekly Updates were published, and tips about what's happening at the Disney theme parks for the coming weekend. We'll also include a fun bonus, such as an Eye Spy or a trivia question. To subscribe to our free newsletter, just enter your email in the box below.